Thanks Betty. This is two separate dies. I think they are Memory Box or Penny Black or one of each!! So many choices out there! So beautiful! Such pretty details that really stand out because of all the glorious white space! Beautiful! I love the silver details. Enjoy your visit with your son! This is such an elegant card, Joan! Simply gorgeous, so elegant and serene feeling. This design would work for any occasion, but one that comes to mind is a sympathy card. Those are so difficult to make. I actually have a leafy branch cut from green vellum on my desk in the use-it-someday-too-pretty-to-throw-away pile. Am I the only one that has one of those? I used to have a pile like that but over the years it kept growing so I tend to toss stuff now. Yikes! 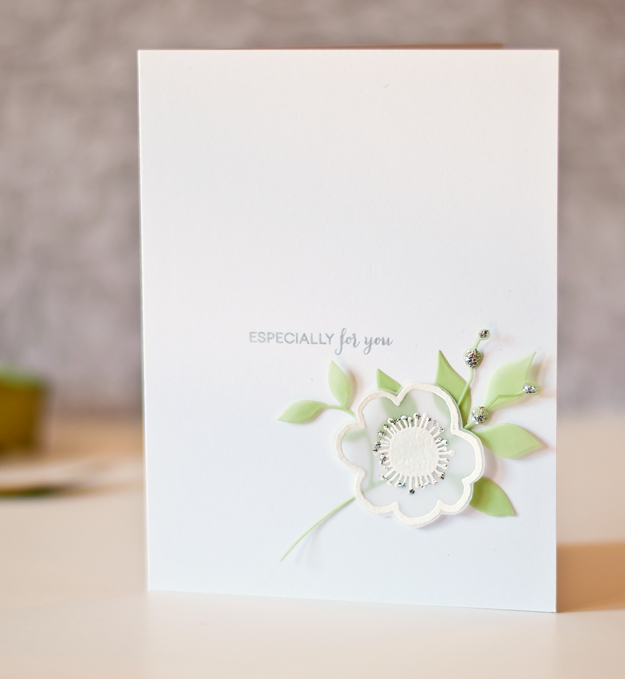 So soft and pretty with lots of beautiful white space..... love every perfect detail! LOVE this! 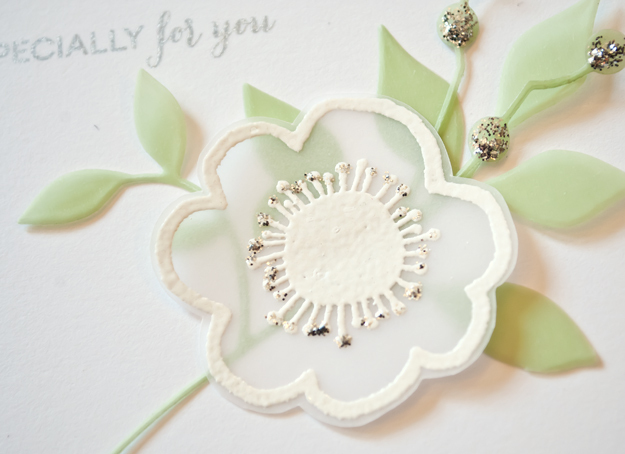 It has green leaves, lots of white, and a bit of sparkle--all things I love. Oh, so pretty! Amazing in a soft and sweet kind of way. So soft and pretty! Very nice. Absoultly gorgeous!!!!!!! Love this Joan! Vellum always intrigues me, and I LOVE your bordered flower and green leaves! What a beautiful card you made. It's wonderful!